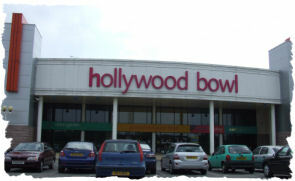 Hollywood bowl is situated on the outskirts of Middlesbrough, just off the A66 on Teesside Park. Hollywood Bowl is the leader in the Ten Pin bowling industry, with the very latest bowling technology. We have 26 lanes with full computerised scoring and self selection automated bumper bars, we can offer Glo Bowl facilities should you want to party ! Bowling is all about knocking down the pins with a ball, the winner being the person who scores the most points! To give yourself a decent run-up, start about four steps back from the foul line, lining your feet up with the spots marked on the approach. Hips and shoulders should be facing the pins, with elbows drawn in and knees slightly bent. First select your ball from the rack. Remember, heavier is not necessarily better as it's technique that counts! Place your thumb and two fingers into the holes, then gently cradle the ball in both hands - taking care not to drop it. As you take your second step the ball should swing downwards and backwards. At this point you may wish to extend your left (or right) hand out to the side for balance. When the ball reaches the top of your backswing, it should be no higher than your shoulder and your arm should be straight. As the ball passes your sliding back foot, allow it to roll off your hand towards the pins in a controlled manner - do NOT throw it as it damages the lane and you may be asked to leave. Don't stop your arm, let it swing up as you follow through. Hips and shoulders should be facing the pins. At all times, try to keep your steps smooth with no jerky movements.